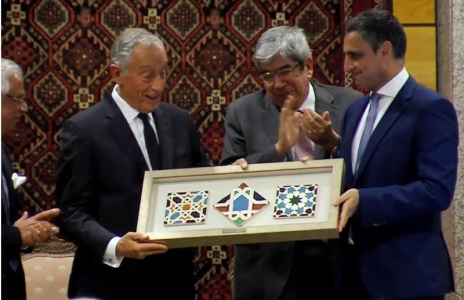 Portugal President, his Excellency Marcelo Rebelo de Sousa attended the 20th Anniversary of the opening of the Ismaili Centre in | Ismaili.NET - Heritage F.I.E.L.D. 2018, December 18 - Portugal President, his Excellency Marcelo Rebelo de Sousa attended the 20th Anniversary of the opening of the Ismaili Centre in Lisbon in the presence of the ex-president of Portugal, the Speaker of the Parliament, the Mayor of Lisbon and many dignitaries. In his speech, he commended the Ismaili community and the work of the AKDN and thanked H.H. The Aga Khan. President de Sousa planted an olive tree for the occasion. Incidently, the Jamatkhana extension in Lourenco Marques (now Maputo) in Mozambique was inaugurated in 1968 by Governor General Dr. Baltazar Rebello de Sousa, father of the present President of Portugal. Small world!